Clerical Whispers Saturday, July 18, 2009 `Bishop of the slums' -- Dom Hélder Camara and Brazil's church of the poor This year marks the centennial of the birth and the tenth anniversary of the death of one of the most significant religious figures of the 20th century, an instigator of the liberation theology trend in Latin American Catholicism and a campaigner against military dictatorship: Dom Hélder Camara. Dom Hélder could have advanced himself to the position of cardinal and from there, who knows, possibly to the papacy itself. Instead, he stood for democracy in Brazil, despite threats to his life and certainly at the expense of his career. 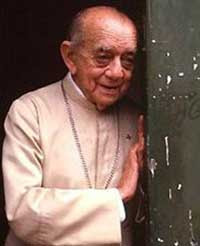 He represented the most extreme point that the Catholic hierarchy could go in standing with the poor in the tumultuous era following the Cuban Revolution and the Second Vatican Council (Vatican II). Did Paul Have a High View of Scripture? The Greatest Myth of Christian Growth Ever!